*The original post of this contents is written in 2015. What Prompted the Infiltration of Social Media in Japan? How do you do? This is Tsubasa Onodera at Members Co., Ltd. 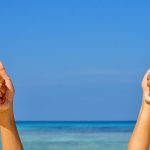 I engage myself in research and surveys as well as the creation of leading-edge cases in an institute within Members called “Engagement Lab,” which specializes in studying social media marketing. 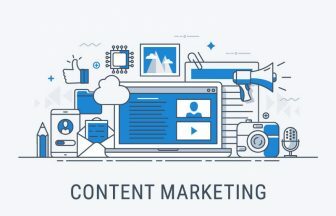 From this article forward, I am going to post a series of articles with the theme titled, “Centralized Operations of Multiple Social Media” to discuss the business utilization of social media for marketing geared towards the corporate social media operators. First, let’s look back on the sequence of events concerning the infiltration of social media in Japan. Although “mixi” was gaining popularity in Japan from around 2005, it was not until about 2011 when social media started to infiltrate with a bombarding speed, like today. When the numbers of Facebook and Twitter users started to rise, the movie “The Social Network,” which portrays the founding of Facebook, was released in Japan. People’s attention to Facebook jumped to a new high. In the meantime, the East Japan earthquake occurred in March of the same year. While all the telecommunication networks, including mobile phones, were down, it was social media that worked as information infrastructures immediately after the quake. I can still recall vividly those media that were utilized for exchanges between families and friends for the confirmation of their safety as well for obtaining updated information about traffic, which was in chaos. Prompted by these incidents, people’s interest in social media in Japan rapidly increased. As Facebook infiltrated into society, many companies started to create and operate Facebook pages aggressively. It was the dawn of the era where social media operation was synonymous with Facebook page operation. Businesses gained a new medium named Facebook, which is a meeting place with living persons as well as where they can reach out to deliver information free of charge. 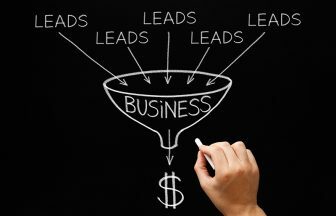 In the early days, the links with living persons (gaining fans) were emphasized, many campaigns aiming for gaining fans were held, and various analytics applications were released. However, as the time progressed into 2014, Facebook banned the fan acquisition activities that incentivized people. 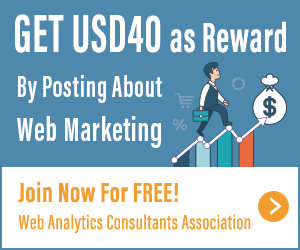 Also, a major change from 2011 started to take place, as the numbers of Facebook pages and users increased; the stage transitioned from free-of-charge organic reaches, tapering down to paid ad-involved reaches, which became more prominent. Furthermore, users’ online viewing environments were also in transition. 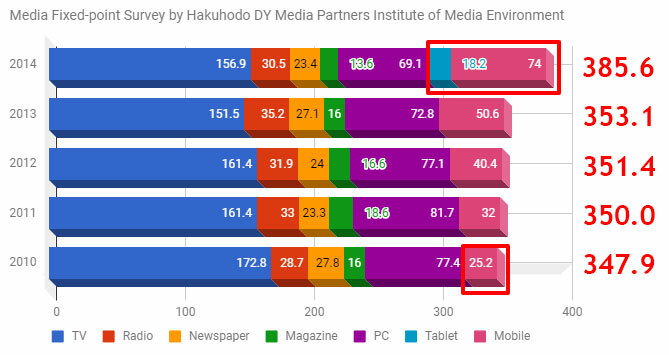 The following is the result of research titled “The Changes in Media Contact Time by Device” conducted by Hakuhodo DY Media Partners Institute of Media Environment. Media contact time on smartphones and tablets has been increasing every year and surpassed that of PCs in 2014. Both senders and receivers of information evolved, and new social media platforms emerged and started gaining popularity. Examples are Twitter, which enables quick messaging with 140 characters; Instagram, which leads to initiation of communication with photos taken on smartphones; and LINE, which is based on communication and information accessed by smartphones. Based on the current state, I consider the centralized operation of multiple social media platforms, including not only Facebook pages but also Twitter, Instagram, and LINE, to be necessary. What is the current state of social media other than Facebook? Let’s take a look at Japan’s domestic and global user counts (monthly active user counts) on the major social media platforms. 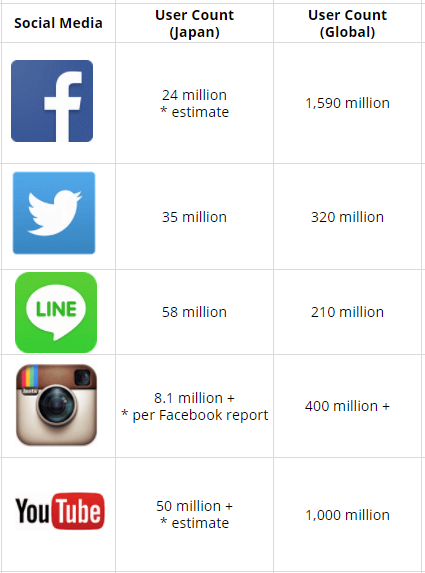 LINE, in Japan, and Facebook, globally, have the largest number of users. Next, we will look at Japan’s domestic social media user counts and social media usage rates. 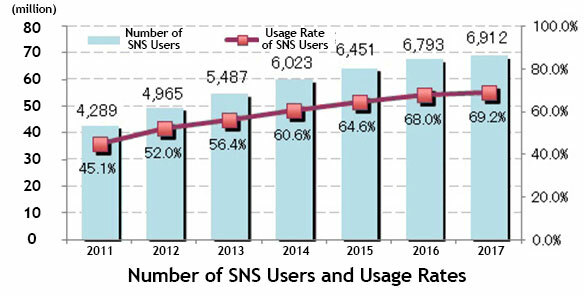 I will use the results of “The SNS Usage Trends” published in July 2015 by ICT Research & Consulting Inc. as a reference. Reference: ICT Research & Consulting Inc.
SNS User Counts and Usage Rates in Japan by ICT Research & Consulting Inc. Ever since 2011 when social media started infiltrating into Japan, the user counts (rates) have increased every year, projected to reach 64.51 million (64.6%) by the end of 2015 and just short of 70 million by the end of 2017. Traditionally, the younger generations in their teens and 20s were the main users of social media, but as social media become more prevalent, I can imagine that the range of user generations is expanding. I will move on to the usage rates by social media platform. From this piece of research also, the result shows that LINE (57.5%) is the most used platform. The new application LINE is attracting people’s interest as smartphones become more ubiquitous. 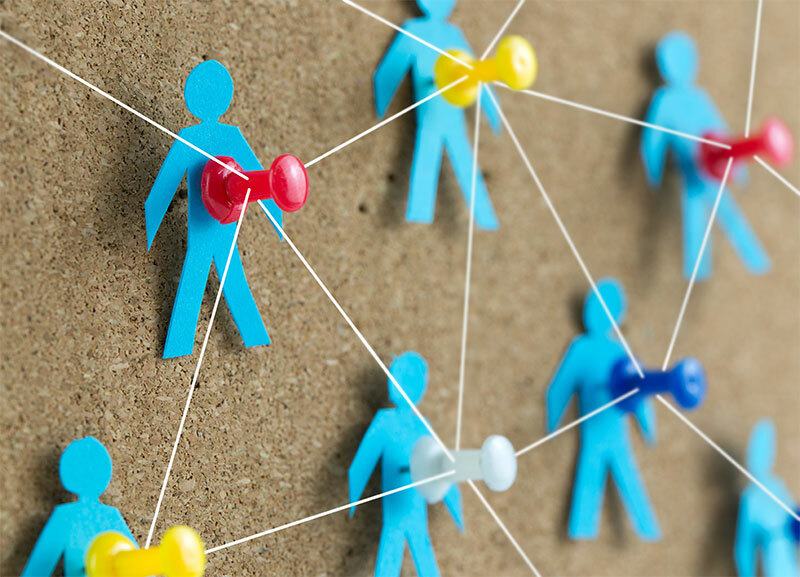 According the same research, 72.9% of people use SNS, telephone, and applications for the purposes of “communication with others,” and it can be considered that the usage of social media as part of the communication infrastructure is rising. Twitter follows LINE with usage rate of 36.6%. Usage of the image-based social media Instagram is rising as well. Usage Rates by SNS – ICT Research & Consulting Inc.
From the data above, two trends appear in living persons’ social media usage. Many living persons use social media other than Facebook, namely LINE and Twitter. Social media usage by living persons is projected to continuously rise. Living persons use two or more social media applications because they use each for different purposes based on the functions and services of each application. Looking at social media from a business standpoint, each social media application has different characteristics as well as strengths and weaknesses for marketing. I have summarized the strengths of each social media application below. Facebook has an advantage in building close relationships with fans whereas Twitter has the strength of urgency in information dissemination and propagation. On LINE, you can realize communication based on large-scale reach using its strength as the largest user-count media in Japan whereas on Instagram or YouTube, you can take advantage of visual materials and use their visual appeals to users’ sensibility. Leading Companies are taking actions towards multiple social media operations. Many companies in Japan have already started to work on centralized operations of multiple social media accounts by identifying the characteristics of each social media application. I am going to show you two companies: Coca-Cola (Japan) Co., Ltd. and Lawson Inc. as examples. They specify product promotions as the object of their social media. Product-based contents are created for each social media platform and posted. Utilizing Twitter’s urgency, they combine their products and seasonal or current topics (the Japanese high school baseball championship or summer greetings in August) to tweet; on Instagram, they post select images of products with a high visual appeal. YouTube is utilized to stock their TV commercials and promotional videos. They are fully utilizing social media for marketing based on the characteristics of each platform. 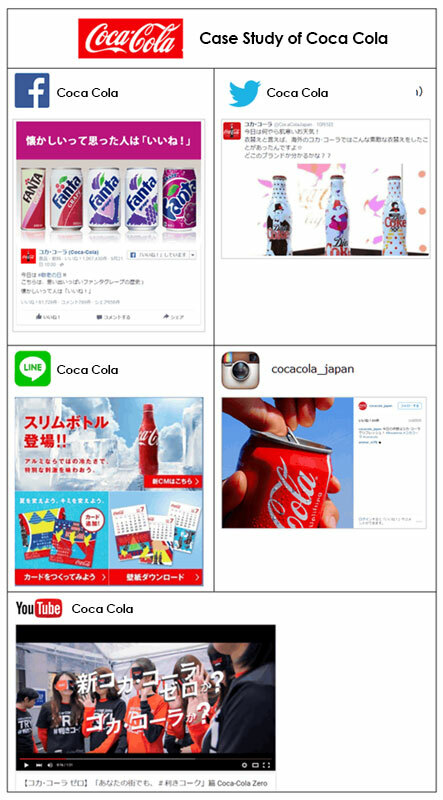 Reference: List of Official Accounts – Coca-Cola (Japan) Co., Ltd. The premise of posting is set that the original character “Lawson crew Akiko-chan” posts information. Their purpose is probably placed on online-to-offline (O2O), that is to promote physical store visits, because they mainly post messages about their products and coupons. Especially on LINE, whose forte is leading users to shops, they aggressively deliver messages about products or discounts. 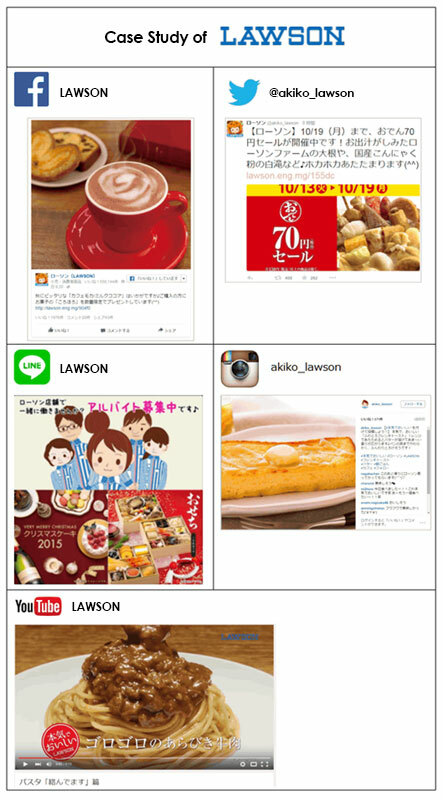 They limit their posts on Instagram to those images of products with a high visual appeal, so Lawson also utilizes social media according to the characteristics of each platform. As I have discussed in this article, we can see the following trends in the usage of social media by people and by businesses for marketing. Living persons use multiple social media applications. Social media usage by living persons is projected to rise steadily. Each social media platform has its own characteristics, and marketing results will increase playing to them. 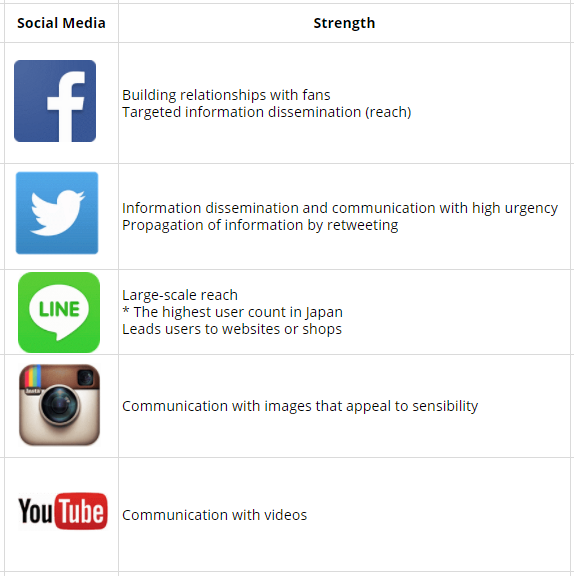 Leading companies in Japan operate multiple social media applications according to their unique characteristics. Based on these trends, future operations should shift from a singular to a centralized strategy of multiple social media channels. Starting from the next article, I will provide you with detailed operating know-how as well as effect measurements discussing various aspects. The next article will focus on Instagram. Japan―Data from October 2015 Video Sites Usage Trends comScore, Inc.
How does the change in Instagram news feeds algorithm affect brands and what should brand do? 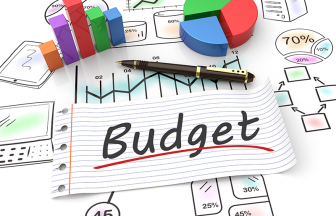 Business Case Scrutinizing Keywords Is Important as Expected!